3000 dead pigs were found floating in the drinking water in Shanghai. In a place like China, where laws are only as good as the people enforcing them and there are many ways to get around environmental protection regulations, there are a lot of problems with the drinking water, but rarely has there been a problem as big as this. Nearly 3000 dead pigs were pulled from the Huangpu River, a major source of drinking water for the city of Shanghai. Shanghai has 23 million residents who depend on various rivers for drinking water. The presence of thousands of dead animals would not be an improvement. The culprit is believed to be a pig farmer from the neighboring Zhejiang province. The dead pigs tested positive for porcine circovirus, a disease fatal to pigs but that is not believe to harm humans, unlike many other pig diseases. 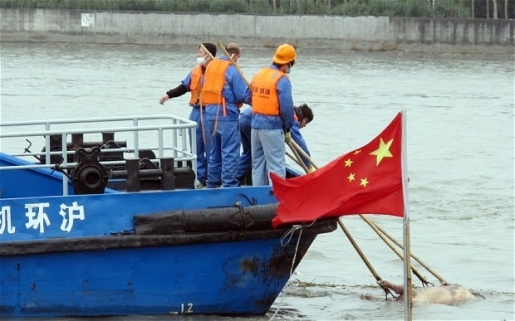 However, dead, rotting pigs in the drinking water is definitely a bad idea, so Chinese environment workers are busy removing pigs from the water as we speak. It takes about 10 minutes to pull each dead hog from the water.